Stream anime episodes online for free, Watch One piece Episode 67 English version online and free episodes. Anime Episode guide One piece Episode 67 English dubbed Deliver Princess Vivi! The Luffy Pirates Set Sail! 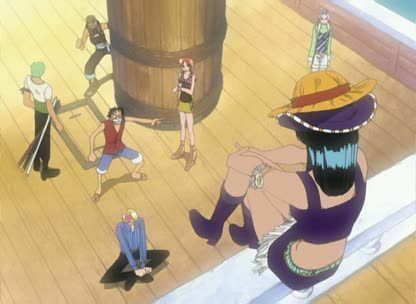 Luffy and Zoro are about to go all out, when Nami arrives and violently ends their duel. Out of imminent danger, Vivi explains that Baroque Works is responsible for inciting a rebellion in her home country, which is why she cannot offer a large reward, and reveals that Mr. 0’s true identity is Sir Crocodile, one of the Seven Warlords of the Sea. Nevertheless, Luffy agrees to take her with them. Igaram sets out on the direct route to Alabasta, as a decoy. As he clears the coast, his ship is engulfed in an explosion. The Straw Hats and Vivi hurry to their ship and set sail, following the log towards Little Garden. Miss All-Sunday, the partner of Mr. 0, appears on their ship. Without explaining her reasons, she offers the crew an eternal pose. However, Luffy crushes it and the agent leaves them.